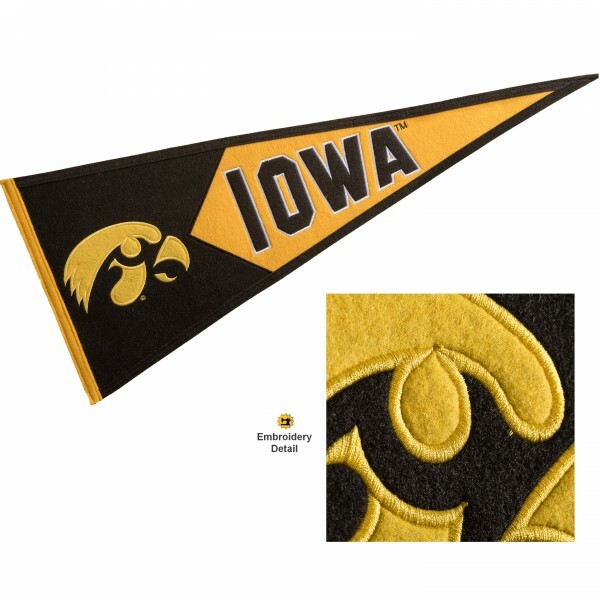 This Iowa Hawkeyes Embroidered Wool Pennant measures 13 x 32 inches, features single-sided embroidered logos and lettering, and is made of a thick wool blend. Each full-size Iowa Hawkeyes Embroidered Wool Pennant includes an alternate color left side header and includes a full perimeter sewn border. This quality college banner is perfect to display on any wall and is officially licensed and approved by the selected college or university. Accessorize these authentic college pennants with our Wood Frame for 13"x32" Pennants or buy one of your favorite felt Conference Pennant Sets.